Inspect & Cloud was built for property managers. We speak the property management inspection language. 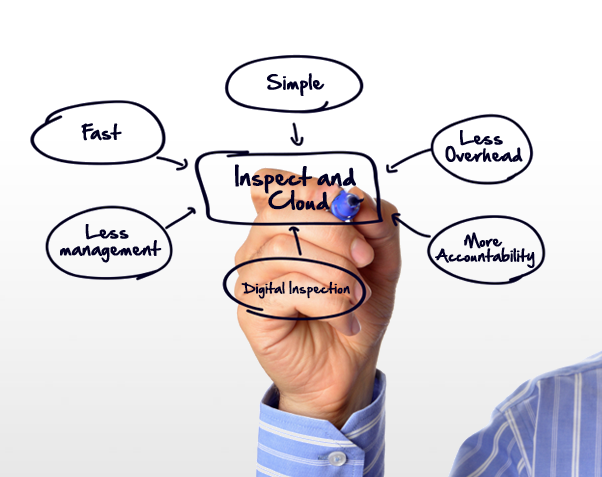 What makes Inspect & Cloud the best software for property management inspections? “Our staff carrying a clipboard, paper, and pen to do our inspections are a thing of the past,” says President of RE/MAX Space Centers, William Knapp. An easy-to-use iPhone or iPad app puts the entire property management inspection process at your fingertips. Every update is fully tested in our real-life property management business. This allows Inspect & Cloud to assure that each of its features is designed and of utmost value to property managers. Inspect & Cloud was designed for busy brokers who need to assign properties to multiple inspectors. Broker View allows for easy delegation and management of multiple property inspectors, while still allowing brokers to easily perform property management inspections themselves. The mobile app syncs directly to the web, allowing property inspection reports to be emailed to property owners, brokers, and managers alike at any time from anywhere. Property information is never stored locally on the phone, keeping property owner’s information safe and secure. Once synced to the web, brokers have full control over who and how a property report is viewed. Property management inspection reports are automatically generated once a property has been inspected and synced with the web. These beautiful PDF reports display your company’s branding and make for a professional presentation and report that property owners love. Inspect & Cloud offers email and phone support for busy brokers with questions. With a 14-day free trial, no monthly contract, and multiple plans to choose from, we’ve made it easy for property managers to get started no matter what size your portfolio. Both the web and mobile application have been built based on real feedback we receive from brokers and property managers. New features like our Productivity Monitor and better property mapping are being added frequently for an ever-improving user experience. “Our agents now have the ability to offer their property owners more of an incentive to use their service. Its like a Facebook for the condition of our properties except this makes us more productive,” says Steve Meadows, President, Meadows Rentals. Easily add and tag photos to each room of a property, while you’re on location. The frustration of getting back to the office and not knowing which photo goes with which property is over. The savings you will experience by eliminating paper, overhead, and excess inspectors more than pays for the cost of the service. On average, brokers tell us they’re saving up to $300 each day in lowered management and overhead expenses. The time it takes to complete a property management inspection is cut in half—sometimes more. By simply and easily organizing the entire day’s property inspections, an inspector can better manage their travel time. The ease of use of the mobile app makes the entire property inspection process more efficient. How are you doing your property management inspections? If you would like to eliminate the frustration of the property management inspection process, we would love to invite you to try Inspect & Cloud free for 14-days. We require no credit card to test out the product and are available to answer any of your questions via email or phone (888.960.6020).